Our best barbecue buying guide will focus on what we feel are best bbq grills out there and the factors you need to know before you buy one. Barbecue grills are becoming a must-have cooking item for most homes because they are a great way of grilling meat for the family meals or even if you have guests coming over. Simply, pull out your outdoor bbq grill, put it on the patio or garden, bring out the sausages or that nicely marinated piece of steak, slap on the burger pate and get ready to enjoy a wonderful meal. What you will enjoy about some of the grills we will review below is the fact that some of them are so compact that you can use it even if you live in a place without a garden or outdoor area like a patio. The electrical ones will allow for use in places where you cannot use live fire. You can get cheap bbq grills, Disposable bbq grills, or even folding bbq grills that allow you to store them easily without taking up too much space. Whichever one you pick should allow you great functionality without being cumbersome or requiring a lot of additions to make it work. In our best Barbecue buying guide, we will explore a wide range of grills including charcoal grills, gas barbecue grills, electrical grills, as well as the accessories you need to have so that you can use the grill properly. Outdoor grilling has become very popular and it is a great way to entertain the family and the guests during the weekend or holidays. A large percentage of homes have barbecues, and you’ll often find family members coming together to have a cook-out session where they can swap stories and enjoy good food and drinks. A barbecue grill is a cooking appliance which has a cooking surface made of metal bars or metal grate which normally has porcelain coating. The grate is put over a fire source that can generate intense heat of up to 260 degrees centigrade or more which cooks the food. There is a wide range of grills available in the market and it is really up to individual preference on which grill you will pick. Let us go straight into the different kinds of grills that are available and what features make them stand out. Charcoal barbecue grills are the most popular and common grills out there. They are very popular especially for those who live in homes with gardens because you will need proper ventilation to use them. You also need to have a level of knowing how to handle fire otherwise not only will it be dangerous for you to use them because of a possible fire hazard, but you will not be able to cook anything because your food will most likely burn if you’re not able to control the fire properly. Remember the temperatures get very high and so you have to be able to control whatever it is you are cooking and how high the temperature of the charcoal gets if you are to achieve a properly cooked meal. One of the most important things to consider when using a charcoal grill is to not use lighter fluid and to use natural charcoal whenever possible. 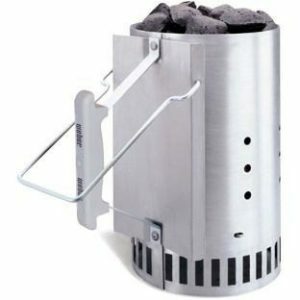 Lighting the charcoal should not be a problem, you can use paraffin cubes or a chimney starter. They are normally cheaper than the other types of grills. They give the meat an interesting smoky taste that is not achievable in the others. Easily portable so you can use it in any setting. You can get really high temperatures if you know how to work the charcoal well. It is best for use in areas with good ventilation like gardens, and so, if you live in an apartment, they may not work for you. You may not be able to use live fire in some areas. Review of our pick for charcoal grills. Whatever type of grilling you have in mind, the Weber kettle is able to deliver. Whether you want it hot or low, fast or slow, you can achieve it with this charcoal grill. It allows you to grill a wide range of foods like burgers, steak, vegetables, among others. 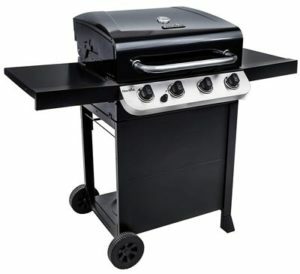 The grill offers a cooking space of 363 inches on a 22-inch diameter cooking grate. 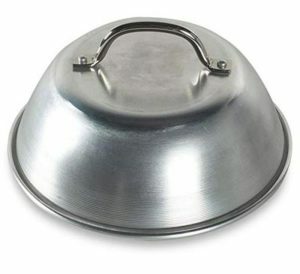 It has rust-resistant vents, porcelain-enamel bowl and lid, nylon glass reinforced handles and a heat shield. It has a one-touch cleaning system that makes it easy to keep clean. The porcelain and enamel help retain heat as well as prevent corrosion and peeling. When the lid is not in use, you can simply hang it on the side, and if you need to move it to a different location, it has wheels that allow for that portability functions. The manufacturer has a 10-year limited warranty on the charcoal grill. To control the heat, all you need to do is adjust the dampers, closing them completely will help extinguish the fire because of lack of oxygen. Depending on how you rearrange the charcoal on the steel grate, you can do the direct or indirect grilling. It has a safety warning on some of the material because they contain chemicals which can cause cancer. The Char-Broil Kettleman’s grill has a lot of headroom and large vents. It has 360 square inches of space on the cooking grate which is made of coated porcelain. This means it will not rust and so there’s no risk of rust getting into your food. The grill grate will not allow food to fall through and you have no risk of flare-ups from the fat. You can easily monitor the temperature using the temperature gauge that is mounted on the lid. The ash bowl allows for easy cleaning. 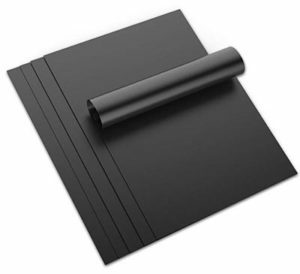 The design also makes it one of the most economical when it comes to charcoal use because you need to use very little. It has a 10-year limited warranty and is easily portable because of the wheels. The bottom shelf keeps the grill stable even when in use. It has an infrared cooking system that allows you to cook your food evenly because you use the technology to control the temperature. Infrared eliminates cold or hot spots and ensures that the temperature is evenly spread. The damper can be opened or closed depending on how hot you want the temperature to get. It also has a 360-degree inlet which allows for increased airflow thus more heating for those foods that require a lot of heat. High-quality material that is corrosion-resistant. The temperature gauge helps you know how hot the grill is. Economical to use due to the infrared cooking system. It is not very sturdy and wobbling is an issue if some of the grills. It would not be good for slow cooking because the grate is too near the charcoal. If you do not take good care of it, it may rust. 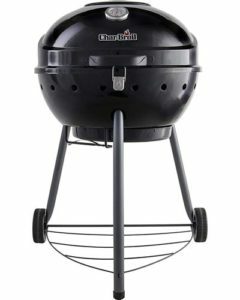 The PK charcoal grill and smoker has a capsule shape and four vents which allow you to cook really fast or slow depending on what you want. It is made of aluminium which is lightweight, durable, and rust-proof and conducts heat more efficiently than steel. 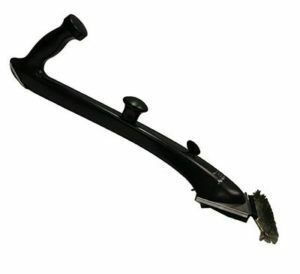 The manufacturer has thrown in a 10-year limited warranty and will even cover you against rust or breakage. You have options for the type of stands you can get, and the main component easily detaches for easy transportation. This makes it great for a wide range of outdoor uses whether at a camping site or at a picnic site amongst others. It has a 300 square inch cooking surface and can hold very high temperatures for a long period of time. Great for a wide range of uses. Good heat distribution making it good for a wide range of foods. Some may consider it a bit small. The grill grates are not very well made. It does not have an ash catcher. Review of our pick for Gas Grills. This use natural gas or propane as the source of heat. They are easy to use because all you have to do is done is turn the knob on or off. You, however, have to be careful about those that need preheating because if you put on the food too, soon it will not cook very well. You will also need an outlet in the wall for the gas so this may be an inconvenience if you have to look for an outlet if you are grilling outside. Some may opt to use propane gas but you still have to deal with the issue of filling up empty tanks when they become empty. This also requires that you monitor the amount of gas you have left over. Gas bbq’s are more expensive than the charcoal ones but they are clean because you do not have to deal with clearing up the ash. Easy and convenient to use because all you need to do is turn the dial. You can opt for propane or natural gas. You can control the heat while cooking. It is not messy to use. You have to have gas. If you are using natural gas, you have to have a wall outlet which reduces the portability of the grill. 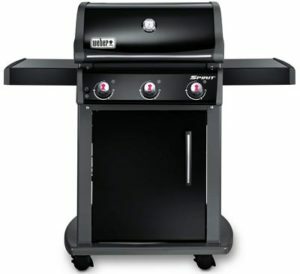 Weber Spirit E-310 gas grills. This is a stainless steel 3-burner grill which has 424 square inches of cooking space, and an additional 105 inches for warming. It has porcelain and enamel coating on the body and grates which helps avoid rusting. All you need to do is turn the button and you light up the ignition system. You do not have to season the grates before you start cooking and are good for a large gathering of people. The design is durable and portable. It has a fuel gauge that helps you monitor the level of propane gas thereby ensuring that you never run out. The shelves on the side’s give you space to hold your pots and pans. The buttons are easily labeled from low to high temperatures. The porcelain enamel coating helps retain heat. It has a gas monitor so you never run out. Some people feel that the material used in its construction is too light. The paint flakes after some time and the grates can rust if you do not take good care of it. It is prone to denting so avoid things that bump into it. 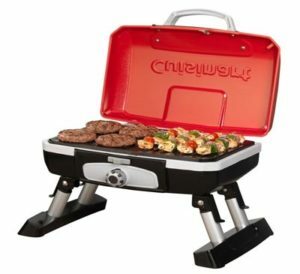 This is a 4 banner cart style grill with a lid side burner. It has 475 square inches of cooking space and porcelain coated iron grates. You also have a secondary cooking space of 175 square inches. It has a stainless steel lid, control panel and handles built for durability and style. It is easy to clean; all you need to use is a damp cloth and warm soapy water. The temperature gauge allows you to know how hot it is. It has an electronic ignition for quick startup. The metal side offers work and preparation space. It has wheels but that makes it portable and is perfect for large family gatherings due to the large workspace. Large cooking and preparation surface. Made of high-quality material that does not rust. If it is not well taken care of it will rust. Some people feel that it does not get hot enough. Some people find that it is hard to assemble. This is a foldable Bbq which is petite and can be used on a tabletop. The stainless steel burner is made of high-quality material that is corrosion resistant and the porcelain enamel grates allow for heat retention. You can set up the bbq easily by removing the aluminium legs and using the integrated lock to keep it secure. It is easily portable because of the briefcase-style carrying handle and is lightweight at only 13.25 lbs. Due to the small size, it is very portable. The handles have a briefcase style design which makes it easy to carry. It has a removable grate making it easy to clean. The small size makes it energy-efficient. The automatic lighter does not respond sometimes. It is not very stable when the legs are folded away. If you do not want to deal with the messy charcoal grill or you find that you do not have the patience for a gas grill, then the next option for you is the electric grill. Check whether it has an inbuilt temperature gauge which will let you know when it is ready to cook. There are some grills that come with an on-light when it has reached the correct temperature. The temperature should also be adjustable so that you can get even cooking depending on what you are making. This is especially important because different meals require different temperatures for cooking and you should be able to control this easily. Also, check that it has the power to recover the heat when you remove the lead. This is because when you lift the lid, some of the heat will escape and if your grill is not good enough it will not recover the lost energy quickly. The temperature should be able to go up high enough if you want functionalities like searing. Get a grill with removable cooking grates and plates. This will help in the cleaning process and you can wash some of them in a dishwasher. If you’re not able to remove them, you will not be able to clean the grill well and will have a build-up of dirt. A floating hinge will also make it easy for you to cook your meals from the top as well. If you’re making sandwiches, for example, it will save you the trouble of having to flip it over by just having a hinge that you can press down on the food. Also check that the cord length is long enough, to enable you to achieve some level of portability. A very short cord will tether you to the electrical supply which may not be convenient depending on the amount of space you have. Make sure that you have enough electricity supply to run the grill, know what you will be using the grill for and check that the cooking surface allows you to make enough food if you will be cooking for a large number of people. What are the advantages of an electric grill? They are easy to control because you can turn them off and on with the flip of a switch. They are easy-to-use and maintain. They do not take long to heat up. Most apartments do not have any restrictions on usage. What are the disadvantages of electric grills? If you cannot add wood chips, you will not have the smokey flavour that some people look for when grilling. It can take some time to cook the meal. You may have to factor in the expense of maintenance if it gets spoilt because you require someone with technical know-how know how to deal with the electrical parts. This electric grill has a 280 square inch cooking space. It also has a 1560watt/120v electric element with a 6ft cord. It has a porcelain enamel coating on the body while the grates are made of cast aluminium. The Weber electric grill can reach very high cooking temperatures due to the aluminium body and the dome cast that has an excellent seal. The technology used in making the electric grill allows for the heat to be reflected inside the cooking chamber thus allowing for higher temperatures. It is easy to control using the knobs and is very easy to clean because of the pan that catches the drippings. Easy-to-use and to set up. It has the ability to achieve high temperatures and very even cooking. The dome cast seals in the heat. You have to preheat it for about 20 minutes and it does not stay very hot. This gives you 320 square inches of cooking surface area. It has the infrared cooking system which spreads heat evenly so you do not have to worry about hot and cold spots. It has a 1750 watts burner which you easily control using a dial. The grate is porcelain coated steel. You can easily move the grill around because of the rear wheels. The body is rust-resistant because of the powder coating on it. If you live in an apartment and you like entertaining, then this is the perfect bbq grill for you. The large cooking surface area allows you to make food that can fit up to 4 people comfortably. If you want the taste of wood in your food, simply add wood chips in the grill receptacle. The infrared technology allows for even cooking. It is rust resistant due to the coating of the steel. You can place wood chips in the grill thereby giving your food the smoky taste that you get when using the charcoal grill. It takes longer to heat up and once it does the grill does not hold heat for long. 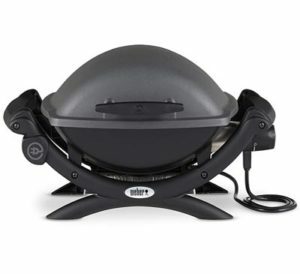 If you want an electric grill for your patio then this is great for you. The Fire Magic is an extremely attractive grill that is made of high-quality stainless steel. The base is very firm and helps to avoid wobbling or tipping over. It has the ability to reach temperatures of up to 725 degrees, but unfortunately, it only has one burner making it hard to achieve convection heating. It has a rotisserie attachment, replacement Pedestals, and shell sets. Made of high-quality stainless steel material and is therefore durable. This is great for indoor use because it does not produce any smoke. 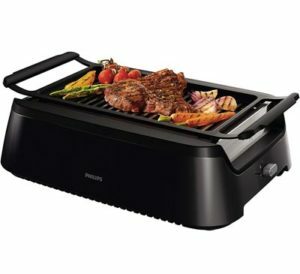 The Philips smokeless grill is able to reduce smoke emission because the heating elements are right under the grill surface itself, meaning that, dripping will not go onto the elements. The drippings collect in a drip pan making it very easy to clean once you’re done. It uses infrared technology and connective heat of up to 446 degrees Fahrenheit. It has heat reflection thus achieving heat all over the grill. It is, however, a very pricey electric grill but the best part about it is that you are sure that your food will cook well because of the technology used. You do not have to adjust the heat and the food can cook in its own grease thus no need to add oil. The 1660 Watts/120 voltage grill heats up in less than a minute leaving you more cooking time. It has non-slip feet to ensure that it does not slip when you are cooking. Infrared technology for perfect cooking results. Pre-heating time is very short. You cannot adjust the heat. Final thoughts on electric grills. Electric grills are a great option for people who are living in places that do not allow the use of charcoal grills. In as much as you will not get the smoky flavour you get with charcoal grills, they are easy to use because all you need to do is turn the button off and on. Make sure you get one with an adjustable temperature gauge so that you are able to control the temperature depending on what you’re cooking. Make sure you take good care of the electric grill so that you do not expose any of the electrical wires which can electrocute you or start fires. Do not place near water because it can enter the circuits and cause a short fuse thus damaging the electric grill necessitating spending a lot of money to get someone to fix it. Smokers are designed to operate and hold relatively low temperatures for long periods of time. These temperatures range between 225 degrees Fahrenheit to 275 degrees Fahrenheit. 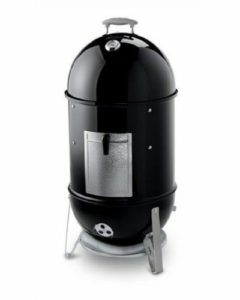 Before buying a smoker, you need to consider some things, for instance, the number of people you will be cooking for, what type of smoker you want whether charcoal, gas, or electrical, ease-of-use because smokers are supposed to run for a long time and you do not want to have to keep on checking on the food, do you want additional functionality other than just smoking the meat, will you be moving it around, and how much do you want to spend. Smoked food has a very distinct flavour and you can also vary the wood flavours to achieve different flavours. If you are using the smoker for entertaining a large number of guests, you may want to hold off on the different flavours because some people may find flavours like mesquite unpleasant. Smoked meat is very tender and moist. Liquid smoke is also great for vegetables and infuses great flavour in them. The Weber products are high quality and durable. The Weber smoker is able to hold temperatures for up to 14 hrs. The temperature is easy to adjust by simply closing and opening the device as you desire. It is 18 inches in length and will cook almost anything you desire. You can easily monitor the temperature using the inbuilt thermometer. If you want your meat extra tender and moist, you can use the porcelain water pan to achieve this. The body has a porcelain- enamel coating with glass reinforced nylon handles and aluminium doors. It also has a heat shield and switch for easy use and control of the functions. Use their chimney starter or any other method you may prefer to get the fire going. Stay away from fuel that has lighter fluid so that you do not contaminate your food. It can maintain temperature for a long period of time. Made of high-quality material that will last a long time. It may be a bit pricey. 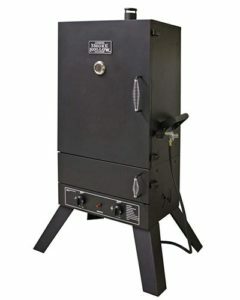 This is a 44 inch two door propane gas smoker with a viewing window, has two wood chip pans to give you more control over how much smoke can have in your meat. It also has a water pan that you can use to tenderise the meat further. Both pans have porcelain coating which helps to avoid rusting. 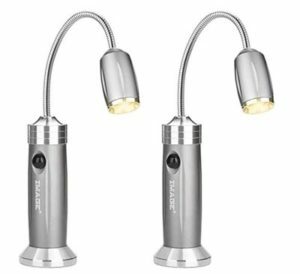 It is made of BTU stainless steel and has two burners with a push-button ignition system. It has 5 cooking grids that allow you to vary the type of meats you can smoke. These are 2 jerky grids, 2 standard cooking grids a sausage hanger, and 1 rib rack. The glass window allows you to see what you’re cooking but remember to keep it clean otherwise you’ll not be able to enjoy this functionality. It has a wood chip pan and water pan. It has five cooking grids allowing for more variety in what you cook. It can cook food for a large number of people. Watch out for small parts that are a choking hazard to children. May require some adjustment for the burners to work properly. 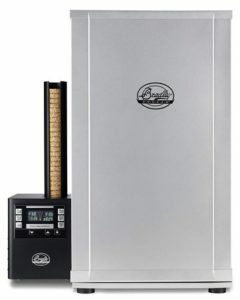 This smoker allows you quite a bit of control because you can set the smoking time, internal temperatures and the amount of smoke. The automatic switch-off feature allows you to set the temperature you want your food to stop cooking at. The digital interface is easy to use, and you can control the two separate burners for smoke output on one and internal heat for the other. The stainless steel interior which has insulation will let you cook your meal at a steady pace for a long time. It has four removable racks so you can adjust the space you require depending on what you’re cooking. It can hold smoke levels for up to 8 hours. If you want the smoky wood flavour, you can use the automated wood-feeding system. User-friendly interface that allows you to control the smoker easily. Can hold smoke for up to 8 hours. You can add wood chips if you want the smoky flavour in your food. Can cook food for a large number of people. You can collect the drippings; however, you will have to remove one of the racks thereby reducing cooking space. You have to use wood bisquettes, not wood chips or chunks. Sometimes these are in short supply and you may have a challenge getting them. It may have a problem keeping high temperatures especially in very cold seasons and opening the door will cause a drop in temperature which takes a long time to pick up again. 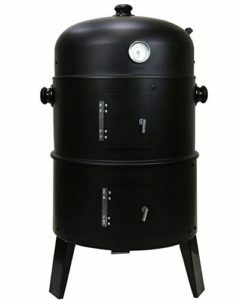 This is a 3-in-1 charcoal bbq grill and smoker. 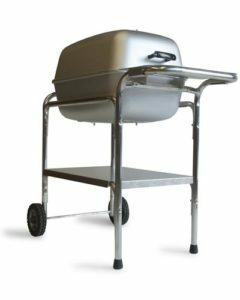 It can grill, roast or smoke your food and comes with grilling racks, air vents that are adjustable, a thermostat and coal tray. It is easy to clean and designed for practical use. It is not expensive and is therefore good value for money. If you understand how to smoke your meat, it’ll achieve great results for you. Where to buy barbecue grills. There are a number of shops you can buy bbq grills from, these include Weber, Argos, Asda, Home-base, Tesco, Reds True, Outback, and of course Amazon. You will realise that it is cheaper to buy the barbecue grill from the manufacturer than from any other source. This allows you to take advantage of the warranty without having to go through a third party. We will share with you some of the places you can find bbq grills. It is important that you do a price comparison before you pick on your final supplier. You also need to factor in factors like shipping costs because you will have to take care of them as part of the buying cost. Some suppliers like Weber say that they can deliver for free if you buy items worth a certain amount of money but this depends on your location. Amazon – recommended shopping place. We have used Amazon as the guide in pricing. The best thing about shopping for your products from Amazon is that you get great variety and a wide price range, and they will ship the products to you whichever country you’re in (confirm that your region is covered). The customer support is also very good. 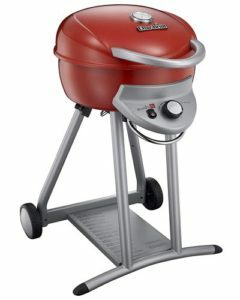 Weber has a wide range of bbq grills whether charcoal, gas or electrical. We have reviewed some of the products and they do have products that are well designed and good quality. Weber only deals in their products and will not, therefore, have a range of brands to choose from. Homebase barbecue – You can get a wide range of bbq grills from Homebase, but you may not be able to get some brand names under their portfolio. Tesco Barbecue -Tesco is an American brand that prides itself in selling American grills. However, they do not have a wide range of products and a cursory glance at their websites shows that most of the brands are not in stock. There are many accessories that can make you grilling so much easier and faster. 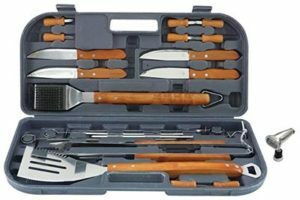 Find below some of the things you will need for a perfect bbq session. Some of the accessories may be used during the actual bbq while some are used in the maintenance of the grill to ensure that your bbq is always kept clean and ready for use the next time around. We have provided some links to give you an idea of what you need to buy, but, it is an individual preference on the type of accessories and where you want to buy them. These make the lighting of charcoal very easy because all you need to do is put the charcoal in the fire starter, use some paper towels, vegetable oil or paraffin and lights it. The chimney fire starters maximise airflow and cause it to carry the heat through the canister. Within a very short time, you should have your charcoal well lit. For a properly cooked meal, you’ll need to be able to measure the temperature to ensure that the food is getting enough heat, whether very high or very low. For example, if you’re cooking meat, how you cut the meat and how big the chunks are will determine how long it needs to cook. A good thermometer, whether it is a probe or readout unit, will help you measure the temperatures as the meat cooks. If you want a properly marinated steak, then submerging it in the marinade may not necessarily work. You may need to inject the marinade directly into the meat so that the flavours penetrate better. Get a good stainless steel seasoning injector model to help you achieve this. The marinade needles are not very expensive and you can get them in metal which is more durable, or the less durable cheaper plastic. You may want to avoid the latter because you will have to keep on replacing them. There are different kinds of seasoning injectors which offer different functionalities and so you need to be very careful about the kind you buy depending on how you like to cook your food. For example, some have small holes that will allow finely ground seasoning to pass through while others have larger holes that allow you to inject garlic or ginger. There are a wide variety of gloves available including gloves which provide two layers of protection like nitrile gloves or cotton gloves which you can use together with nitrile gloves. 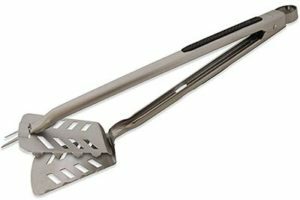 This allows you to handle hot objects when you grilling without burning your hands. There are also leather gloves which are very good for very high heat. 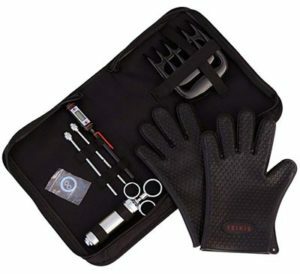 We have picked on this because this set gives you so many functionalities all nicely packaged into one. If you will be grilling fillet, for example, you will need a spatula, you’ll also need tongs for the meat, you need a fork for stabbing the chicken breasts, and you may need a bottle opener to open a beer to cool you down as you do the grilling. If you prefer to have more, you can purchase a stainless steel set that gives you a whole range of functionalities. Mr. Bar is an 18 piece stainless steel fit that provides a whole range of tools you can use including forks, spatulas, bottle openers, all-purpose knife, skewer, scrapers just to name a few. If you will be spending some time outside in the evening especially during the all night long summer parties, then you may need to have good lighting for the dark evenings. Unless you have extra bright lights wherever you are using the grill, you should consider getting a grill light. The downside to grilling is that you have to clean up the grates. Yet, if you want to enjoy your next grilling session you cannot afford to use a dirty grill. This is why you need a grill brush that will help you scrape off anything that is stuck on the grates. Stainless steel bristles are good for this and you need to make sure that whichever brush you get does not lose its bristles because it can end up in your food and cause serious injury to your mouth. You should get one that can store water so that, as you clean it rinses in one go. If you do not want to bother with very high tech cleaning equipment, you can get a simple wooden paddle which comes with the main advantage of not leaving behind bristles in your grate. These can be used on any cooking heat, and provide a solid cooking surface, and you do not have to worry about seasoning because it comes pre-seasoned. You can also purchase grill mats that can be used for cooking more delicate foods such as eggs, tomatoes, cheese, mushrooms amongst others. You do not need to use oil on them and they are dishwasher safe. This is perfect for when you’re making burgers or anything that requires to have melted cheese on top. With so many accessories available, it would be impossible to exhaust the list here. It is also not possible for you to buy all the accessories, so it is important that you are clear about what you want and what you use a lot of, and buy only what you need. Just off the top of our heads, we will say that some of the most important accessories are the thermometer, seasoning injector, tongs, the bristle brushes or paddle for cleaning purposes, and the night light in case you have the bbq late in the evening when it starts to get dark. You also need gloves to keep your hands safe as you grill. While we have given our recommendation for some places you can get the accessories, you should do a price comparison just to make sure that you’re getting the best deals. However, remember to buy very good quality so that you do not have to keep on replacing them. n our review of the best bbq grills, you may have come across some terms that you’re not very familiar with. We will explore some of them below. People use the word barbecue to describe anything that they cook over a grill. However, the real meaning of a barbecue describes the technique in which you cook your meat over low heat which generates a lot of smoke. This is a method of keeping your meat tender while it is roasting. You use pan drippings, butter, and oil amongst others to make sure that you do not lose the natural juices in the meat. You apply the baste directly on the meat throughout the grilling session. You use a basting brush to spread the marinade evenly over the meat. Gets one of the long basting bushes so that you do not burn yourself. This is anything used to give the meat an extra flavour and most have tenderising actions as well. You can rub it on or immerse the meat in the marinade mixture if you are not using dry rubs. Searing basically means caramelising the meat you’re cooking. The idea is to let the meat sit on the grate until it releases itself and then you turn it over. If it is still sticking onto the grate then it is not ready to be turned over. This is a technique where you sear your meat and then simmer it on low heat in some liquid. This is an accessory you use to start the fire. You only need a matchbox, some pieces of paper and charcoal. If you can, avoid using lighter fluid because it will transfer to your food. This is where the food is not placed directly over the heat source. The cooking is done using an adjacent heat source. It can be from natural sources like having an air flow in a charcoal grill or using a fan to create an air flow. It allows for more even cooking and you do not have to have a lot of technique to be able to use it. This combines the techniques used in grilling and barbecue. Placing the food on one side of the heat source means that the food will take a bit longer to grill than if you are doing it over a direct source of heat. It is good for cooking whole chicken, ribs, turkey among others. When you are done with grilling the meat, you should let it rest for about 10 minutes before you cut it. Remove it from the grill and place it on the carving board or on a plate so that the juices distribute evenly within the meat. In this way, you are able to get moist meat with great flavour. This is done for two reasons; one is to preserve heat as is done with ham, bacon, or fish. The second reason is when you are barbecuing meat and the process can take a whole day depending on what type of meat you’re cooking. We have reviewed some of the best smokers you can get for this process, and the result is that the meat comes out very tender and juicy. If in the market looking for a bbq grill, you will find so much variety out there and so many brands and so many salespeople talking to you about the wonderful features their bbq grills have. The result is great confusion because of all the information coming at you. To help you out, we will review some of the things you need to consider when you are looking for a bbq grill. We have given you a review of the different types of grills available and this should help you start the process of deciding what kind of grill you really want to buy. They all have their pros and cons and it really comes down to individual preferences. Some people like the smoky flavour that the meat gets when grilled on charcoal, some people prefer the convenience of just turning it on and off and will, therefore, opt for electrical or gas grills, others do not like the mess that comes with using charcoal grills, among other factors. Have a clear thought process because it will also determine the accessories you will need to buy depending on the kind of grill you choose. Decide in advance how much want to spend before you set out on the shopping trip. Just have it at the back of your mind that gas and electric grills are generally more expensive than charcoal grills. Also think about the additional things you will need to have before you can use the grill for example, if it is a charcoal grill you need to buy charcoal and a fire starter if it is a gas grill you will need to factor in the natural gas or propane gas. 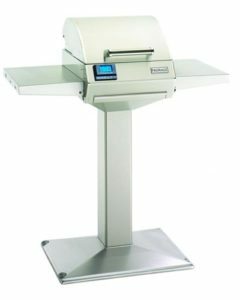 One burner grills cost less but you’ll have to deal with the challenge of cold spots. More burner options allow you to choose various temperatures thus even cooking of food. Be realistic about your use, if you have a small family and do not host large gatherings, then it would not make sense to buy a very big grill. The kind of use to which you will put the grill will, therefore, determine the size you buying. However, have one that makes it easy and comfortable for you to cook. Buy a grill with a large cooking surface, which will allow you to cook more than one type of food at a time thus helping you cook faster. Those with preparation areas are also more convenient to use because you don’t have to keep on moving from place to place with the food you are preparing. If you know that you will be using it for a number of outdoor activities, then buy one that is compact in design and easily portable and therefore not too big. You should look for a grill with quality, durable material that is corrosion resistant. Stainless steel and aluminium are good materials but you have to take good care and make sure that you clean them properly and keep them away from moisture to avoid corruption. Porcelain and enamel which is used in the construction of some of the grills are great in the retention of heat thus improving efficiency when cooking. This is also very good for charcoal grills because you end up using less charcoal. Grates made of porcelain coated iron are especially good for cooking because they capture heat and hold it in, stainless steel grills are also good because they conduct heat very evenly and are easy to maintain and clean. You may, however, want to read the warnings associated with some of the materials, for instance, some of the grills contain nickel which has a cancer hazard warning on it. If you have a gas grill, look for bars which have flavourisers. Flavourisers vaporise drippings instead of letting them clog the pores thus giving your food more flavour while keeping the bars clean. Look for a grill that gives you more than the bare minimum. This is especially true if you are paying a premium price for the grill. Such features include rotisseries, side storage, warming racks amongst others. However, if you are supposed to pay for these extras, any may want to consider improvising when using the bbq so that you avoid this additional cost. While they may look very attractive to have, you’ll realise that they’re not very necessary because they do not have a direct impact on the food you’re cooking. Final thoughts on what to consider before buying a barbecue grill. The kind of grill you buy will end up being an individual decision. It all comes down to your preferences and the amount of money you have. However, it is important to take note of some of the things we have highlighted to help you get a good grill. Make sure that the components of the grill are things you’re comfortable with, do a little research on the background of the company you are buying from, read user reviews and check some of the things they say just to make sure that you understand the good and the bad of whatever you’re going to buy. Pay close attention to the quality of the material, because it will determine the durability and the safety of the barbecue grill. You should also consider where you will be using the grill, for instance, if you live in an apartment then a charcoal grill may not work for you. In some places, you are not allowed to have live fire, so having a Charcoal grill will not be an option for you. If you do not have a gas outlet or electrical outlet where you want to place the grill, then you can quickly cross off this two. Finally, buy from a company that offers you a warranty. A warranty is a clear sign that the manufacturer has the utmost faith in his product if the manufacturer is not confident about his product and does not offer a warranty, why should you buy it. With good care, your bbq grill can last years and years. You will realise that despite the high-quality durable corrosion free material used in the construction of most of these grills if you do not maintain them well, they tend to rust or dent or some of the parts fall off. However, with just a few easy to implement tips, you can make sure that your grill stays clean and in good condition. Protect it from the elements, like extreme heat or extreme cold. Also, ensure that you store it well, avoid places with moisture or where it can get dents. So, how can you take care of your bbq grill? Most bbq grills have porcelain and enamel coating. This makes them very easy to clean because all you need to do is wash with gentle detergent, especially before you first use them. For those that are not coated, they have a thin layer of lanolin which is put to prevent rusting; you, therefore, have to season it by washing and drying it well. Thereafter apply a little cooking oil on it then heat it for about 3 minutes. You should continue to apply cooking oil before you use it so that the food does not stick to it because you’ll have to scrape it off and it could end up spoiling the grates. After using the grill, clean it and apply a layer of oil on it to prevent rusting. Make sure the place you keep your grill has good ventilation and has no items around it that can combust. These include dry leaves, clothing, and flammable liquids among others. Place it on a flat surface to avoid wobbling or tipping over. How to clean your bbq grill. You should never leave your bbq grill dirty after using it. Make cleaning after every use your routine. This way you will not get a build-up of dirt or oil leading to excess smoke when you use the grill. A dirty grill will end up changing the flavour of your food and it will not be an enjoyable experience eating it. Clean the grill while it is still a bit hot because the food will not stick to a hot surface. This is especially true for those foods that have a lot of fat content. Do not use harsh chemicals on the grate because if you do not rinse them off properly, you’re at risk of contaminating your food. Use warm soapy water and only use the hasher cleaners if the soapy water does not clean the bbq grill properly. A bristle brush is a great way of keeping your grill clean. Preheat the burner so that any debris that is left on the grates turns into ash, and then use the brush to clean the grates. For a more thorough cleaning, remove them, and use some dishwashing liquid or warm soapy water which will cut the grease, and then use an abrasive pad to give it a thorough cleaning. Wire brushes are also good for this function. Be observant because some bristle parts can remain behind and get into your food the next time you’re cooking. Regularly remove the tray of the grill so that you can take care of ash and grease that may fall through. Use the scraper to get rid of any grease. Charcoal grills require that you empty the ash pans every time you use the grill. Take care of the knobs and spray them with lubricants to avoid rusting. Use the right cleaning material for different materials. For example, for porcelain, you can use glass cleaner and stainless steel cleaners for stainless steel. For stainless steel, use a microfiber towel, and avoid very aggressive cleaners because they will damage the stainless steel. How to store your barbecue grill. Keep you bbq grill away from extremes of weather. Keep it under some type of shelter whether in the garage or under a protective covering, this prevents rusting as well as a build-up of dirt. Turn off and disconnect the electrical or gas grill from the gas hose or sockets. Clean the grill while it is still warm especially if you were grilling fatty foods. Use soapy warm water and not abrasive harsh chemicals because this will damage the bbq grills. Empty the ashtray after each use when using a charcoal grill. Apply oil on the grates to avoid rusting. Use a bristle brush or a scraper to remove any dirt from the grates. Store the equipment well after use, away from moisture and extreme heat. Final thoughts on taking care of your barbecue grill. When you are buying your bbq grill, you will find that the manufacturer has said that the equipment you are buying is durable and made of the highest quality material that will resist corrosion. You however also have to play your part, if you do not take care of the equipment well, you will be one of the reviewers who talk about how disappointed they were with the equipment because of rusting or denting. Clean your bbq grill after use, apply oil to avoid rusting, and place it under cover so that you avoid moisture which could lead to rusting. If you disassemble any of the parts when cleaning, make sure you carefully note which part goes where otherwise you will not be able to enjoy the grill, and in some cases, it can be dangerous especially if you are using a gas grill because any leaks can lead to fires. If you use your grill quite a bit, and you have discipline when it comes to cleaning, you will not have any issues and will really enjoy the grill. Try and do a thorough cleaning of the grill at least once every year. This means that you clean the grill inside and out to remove any dirt that you may not have taken care of during the routine cleaning. It will also give you a chance to lubricate any parts to avoid rusting. Doing a perfect grill requires some refinement on technique. You will sometimes hear people saying that the barbecue grill did not deliver as per expectation, it did not cook well or that the temperatures did not reach the required levels, the food burned, among other issues, yet the truth is they did not have the right technique to achieve the perfect grill. We will give you a few tips on how to achieve the perfect grill. Due to the fact that grilling involves cooking food directly over a heat source, it is important that you know how to control the heat if you want to achieve that perfect sear, tenderness or moisture levels depending on what you’re cooking. The choice of the bbq grill is dependent on the individual. Choose a grill with a large cooking area to allow you to prepare many types of foods for a large number of people. Look for one that is convenient for you and one that you can use where you live. Some areas will not allow you to use live fire and so an electric grill would work best for you. If you like food that has a smoky flavour, then you are better off going for a charcoal grill. You will also need to look at the type of heat that the grill comes with. There are some that have direct heat meaning you cook the food right on top of the heat source. This allows you to cook your food very quickly because of the intense heat. Use it for thin cuts of meat like burgers or steaks and some vegetables. For larger cuts of meat using direct heat will result in the outer part cooking while the inside remains raw. Other foods like fish cannot be cooked over direct heat because they will burn or become dry. If you’re using a charcoal grill, let the charcoal burn until it has a whitish-grey ash cover which indicates that it is at the best temperature for cooking. Scatter the briquettes or charcoal evenly over the grate. Use a drip pan to catch the drippings which you can then use as basting to add flavour to the food. Scattering the briquettes or charcoal allows you to create consistent heat that’ll envelop the food. Try as much as possible to use natural charcoal which does not have any additives. Briquettes may contain wood scraps, sawdust, sodium nitrite or even lighter fluid. This will not be good to have in your food and may even have implications for your health. If you do not clean your grill well, your food will attain some flavours that may be very unpleasant. Make sure you keep it clean using the tips we have already highlighted above. It is important that you control the heat of the barbecue grill; gas and electric grills allow you to simply turn the dial to the appropriate temperature. For charcoal grills, you need to use the air vents to control the heat. Do not cover the vents at the bottom because you need the air to flow. Keep the top partially open for the same purpose. The more vents you have open the more your grill will get hot, and you need to be aware of this when you are grilling your food otherwise it will burn. Cook the food with oil to promote caramelisation and to avoid sticking. The oil also prevents the moisture from escaping from the food which would result in dry food. There are certain things you need to consider when doing food preparation like avoiding cross-contamination by using separate cutting equipment for different kinds of foods, for example, do not use the same knife to cut meat and vegetables. If you’re marinating your meat, keep it in the fridge as let the marinade penetrate the meat. Do not use the marinating liquid to baste the food. Marinating is important because it stops the formation of some carcinogens that may be harmful while giving you great tasting tender meat. Check the temperature of your food. One of the most important grilling accessories is a thermometer. This allows you to know when your food is cooked perfectly because it checks the internal temperatures. If you do not know how to grill, you will cook the outside of the food while the inside remains raw which can cause digestive disorders. Having a thermometer will let you know when you have the right temperature meaning for proper cooking of your food. When you finish grilling your meat, let it rest for a few minutes so that the juices can distribute evenly. Only then should you cut it, otherwise you’ll find some areas are dry while others have excess moisture. Final thoughts on grilling techniques. No matter how expensive your grill is, if you do not have the right technique, you will never be happy with the results of your grilling efforts. Make sure you prepare the food well, have the right size and thickness when you’re cutting the meat, and use the right temperature to cook your food well. Be careful about the temperature you use because if it is too high the food may burn on the outside while the inside remains raw. If you do not take care not to lose the moisture especially for meat, you will have a very dry piece of meat that will be tough to eat. If using direct heat, you need to be able to control the temperature appropriately and remember to use the thermometer to check that the insides are ready. You should also have an indication of how long you should cook a particular meal because different kinds of foods have different cooking times. And when you’re done with the grilling, remember to clean it well make sure all the parts are dry and then store the grill in a place that is safe. In our best bbq buying guide, we have tried to provide a very exhaustive rundown of everything you need to know with regards to barbecuing including best bbq grills, grilling accessories, grilling tools and how to take care of your bbq grill. Whichever type of bbq grill you decide to buy, take care of it well because it is an investment you only want to make once in a lifetime. Keep in mind the correct way to use it and the accessories you need to have so that you do not damage your bbq grill in the process of grilling. Take care of yourself so that you do not hurt yourself, electrocute yourself or have gas explosions because of momentary carelessness on your part. Clean and store your grill well so that you can enjoy years of use from it. 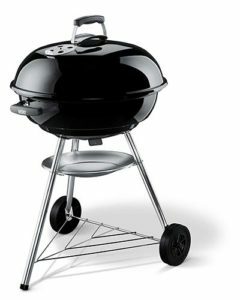 Before you go out and buy a bbq grill, consider what factors you like the grill to offer you and do a price comparison.